Employment and education are essential elements of recovery for people with mental illness. Ontario can do a better job helping people with mental health problems to connect with the labour market. We know this because research analysis tells us — and because the experience of other jurisdictions shows us. We also know that labour force participation pays enormous dividends in quality of life and improved health. There is no single answer, program or initiative that can radically increase employment opportunities for those with mental illness. But the right combination of employment support services, disability income programs, human rights legislation, and education and economic incentives can make an enormous difference. This paper is intended to support these efforts. Policy-makers are looking for solutions. The Canadian Mental Health Association (CMHA), Ontario and the Centre for Addiction and Mental Health (CAMH) are encouraged by the renewed focus on Ontario Disability Support Program reforms, Ontario’s poverty reduction strategy, and the development of a long-term Ontario mental health and addiction strategy. As we embrace a recovery-oriented mental health system, opportunities to strengthen access to education and employment must be pursued. Ontario has some of the most progressive human and disability rights legislation in the world. Building upon achievements in this area and educating people about their rights is essential. The economic challenges facing the province and internationally will have significant negative repercussions for people who are already marginalized in the workforce and society. Taking action to strengthen the application of rights in the workplace can help mitigate the impact of higher unemployment rates. In today’s economy, meaningful workforce participation is increasingly determined by education level. Yet many of the most serious mental health problems present themselves first in late adolescence and early adulthood, interrupting programs of study. This is a critical time to intervene, with programs and supports that target young people struggling to complete their studies. There is extensive evidence that these programs help young people with mental illness complete their studies and move into the workforce. These efforts must be better supported. Evidence-based practices in supported employment programs and ongoing reforms to disability benefit programs must be part of the public policy efforts to support recovery. There are promising practices with impressive records of connecting people with mental illness to the workforce, and of strengthening that connection. Unraveling the different levels of support offered to persons with mental health problems — and addressing disincentives — is a complex task. To accomplish this, we must have increased dialogue and collaboration among levels of government, government departments, the mental health sector, employment service providers, employers, and people with mental illness.Research and development of innovative solutions such as social enterprise, incentives for employers and access to training and education can help fill in the gaps in the knowledge base. International jurisdictions are far ahead of Ontario in many aspects of workforce participation for people with mental health problems and other disabilities, but there are significant improvements taking place to build upon. CAMH and CMHA Ontario welcome the opportunity to work collaboratively with all stakeholders, and most importantly people with mental illness, to build a program for change. Employment and education are important for people with mental illness. As individuals, our own experience provides the best evidence of this, whether or not we deal with mental illness. Education and employment are fundamental aspects of our social context and are directly linked to health and quality of life. The purpose of “Employment and Education for People with Mental Illness” is to look at how we can work together to build a program for change. Achieving a program for change is based on partnerships, involving consumers of mental health services, consumer-run groups, families, clinicians, government, unions, community agencies, and the private sector. This discussion paper is itself a collaboration of the Centre for Addiction and Mental Health and the Canadian Mental Health Association, Ontario. The Canadian Mental Health Association, Ontario is a provincial association committed to improving services and support for individuals with mental illness and their families and to the promotion of mental health for all Ontarians. Policy research on employment for persons with mental illness is an active area of our work. CMHA Ontario addresses employment policy issues by preparing briefs, convening key stakeholders in dialogue, identifying policy options, and making recommendations for policy directions and system enhancements. CMHA Ontario also convenes a provincial mental health employment supports network comprised of forty employment supports provider organizations in Ontario. In addition, employment supports and services are regularly profiled in Mental Health Notes, a bi-weekly e-bulletin and Network, a CMHA Ontario magazine that brings together different perspectives on issues important to everyone with an interest or involvement in community mental health. The Centre for Addiction and Mental Health (CAMH) is Canada’s leading addiction and mental health teaching hospital. CAMH supports the recovery of people affected by addiction and mental illness through integrated clinical practice, health promotion, education, public policy development and research. CAMH has central facilities in Toronto and twenty-seven community locations throughout Ontario. Dedicated professionals provide a variety of supported employment programs, assist people to navigate complex income and employment benefit systems and contribute to policy making, knowledge development, and public education. The value of quality employment for the maintenance and improvement of mental health for all people is clear and widely understood. Extensive research has demonstrated the specific benefits of employment for people with mental illnesses. With education and employment, individuals often experience reductions in their symptoms and hospitalization, as well as improved quality of life3. There is no single solution to the employment and education challenges that confront people with mental health and addiction problems. With lifetime prevalence rates in excess of 20 percent, the livelihoods of millions of Canadians will be affected by mental illness or addiction. This paper is focused on addressing the needs of individuals with serious mental illness. In most cases, mental illnesses such as schizophrenia or bipolar disorder first occur in adolescence or early adulthood, which coincides with the usual life-cycle events of training and entry into the workforce. Often these diagnoses are accompanied by a co-occurring substance use disorder. These circumstances often make it difficult for individuals to complete their education or secure their first job. There are many other employment-related issues for those with mental health and/or addiction problems, including workplace retention and post-disability return to work. These matters are the focus of other important research and policy work — at CAMH, CMHA Ontario, and beyond — but are not addressed by this paper. Recognizing the diversity and uniqueness of each individual is critical to developing solutions. The experience of mental illness may begin early in a person’s life and significantly interfere with their ability to complete their education and to enter and stay in the paid labour force. Others may experience a mental health crisis and be forced to leave their work, or attempt to balance periods of work and periods of disability. For people with mental illness, being involved in work and education has benefits beyond managing symptoms. These include improved social and cognitive abilities, self-esteem and social networks.All of these factors support people’s ability to live independently and have a decent income. Further, it is evident that individuals with mental illness value work, are motivated, and can succeed in a variety of jobs requiring different skills and abilities. The evidence shows what consumers themselves report — that work has financial, social, mental health and other benefits unique to each individual. Despite these obvious benefits, unemployment rates for people with mental illness are significant. While the numbers vary depending on different factors, it is clear that people with mental illness experience much higher rates of unemployment than people with most other disabilities and health conditions, and substantially higher rates than the general population. For people with the most severe and enduring disorders, unemployment ranges from 70 to 90 percent. In one Ontario study, only 25 percent of the people who were clients of the community mental health sector had a job. One-third had less than a high school education, compared to 24 percent of the Ontario adult population. Even for people with depression and anxiety, rates of unemployment can be over 30 percent. Individuals with mental illness may also have difficulty accessing and completing post-secondary education. Without educational achievement and quality employment, individuals face poverty, alienation, high levels of boredom, increased risk of addiction, isolation, and deteriorating mental and physical health. While the human costs of unemployment and lack of access to education are significant for individuals and their families, there is increasing recognition that the entire community suffers when valuable human resources are wasted. Given the current environment of economic uncertainty, the need to think beyond old stereotypes about people’s capabilities and limitations is all the more urgent. Having access to work is essential for the well-being of people with mental illness and for society as a whole. In a competitive and globalized world, the skills and talents of all citizens need to be realized. Despite this, employment rates remain low and a great deal of human potential is being wasted. Rights: The playing field needs to be level so that people with mental illness have the same opportunities as everyone else. This can be achieved by addressing barriers to human rights and fair treatment, including the damaging effects of stigma and discrimination. Economy: The underlying economy and the nature of the jobs that are available must be explored to identify opportunities that meet the employment needs of people with mental illness. Knowledge: Access to a variety of specialized mental health employment support services, particularly those that have solid research evidence demonstrating their effectiveness, must be increased. Ongoing evaluation and development of innovative approaches also need to be supported. Income Support Policy: Provisions of disability income programs acts as a barrier to securing and retaining employment. The federal and provincial approaches in Canada have been improving, but they still create significant disincentives for people to return to work. Federal and provincial disability income programs need ongoing reform to ensure their modernization by removing unintended disincentives to returning to, and retaining, employment. What is clear is that the ingredients are in place for positive change. What is lacking is putting these ingredients together in the right ways. Creative and innovative responses to many of the barriers that exist have been developed. International research has shown that by putting together the right ingredients a number of jurisdictions have reduced unemployment levels for people with mental illness to the 45-50 percent range. Working together to get the right mix can support progressive change. We will now look at the four areas above in more detail. Historically, support for people with mental illness was seen as the responsibility of health and charitable services. The main concerns were care and maintenance. Today, with better treatments and a focus on recovery, the situation has changed. It is now recognized that in addition to the very real challenges created by mental illness, the attitudes and practices of society are large contributors — in and of themselves — to disability. Consumers have spoken most eloquently about this and have led the process of changing how we see capacity. This situation means that people with mental illness need to have a full and fair chance for inclusion in work and education. Fundamental to this are human rights that are supported by comprehensive legislation and effective practice. Two levels are critical: formal protection in human rights legislation and a climate in workplaces and schools that is unbiased and accepting. The Ontario Human Rights Code (the Code) protects the rights of people with disabilities, including psychiatric and substance use disorders, at work, in educational settings, services and other aspects of living. Providing modifications or accommodations to structures and processes to allow people to perform their jobs or complete their education is required up to the point of undue hardship on the employer or academic institution. Legislation that protects human rights plays an important role, and there have been significant positive impacts in employment law and practices as a result of precedent-setting cases. However, the reality of people’s experiences is often quite different from the vision of human rights. The Code recognizes that discrimination may take different forms. Overt discrimination is grounds for a complaint. An example of overt discrimination is automatically refusing to hire a person because they disclose having a psychiatric disability and request accommodation. Conversely, covert discrimination occurs when apparently neutral systemic factors, job requirements or policies result in adverse effects on people with disabilities. Police record checks are an issue of indirect discrimination. Reviews of employee and volunteer applicants by police services for any contact with police can in certain cases disclose an individual’s apprehension under the Mental Health Act. Although this is not a record of criminal behavior, concerned employers and educational institutions may inappropriately use this information to exclude people with mental illness from employment, volunteer and educational opportunities. Human rights bodies play a role in increasing awareness of human rights issues, including accommodations for students, volunteers and employees with disabilities. 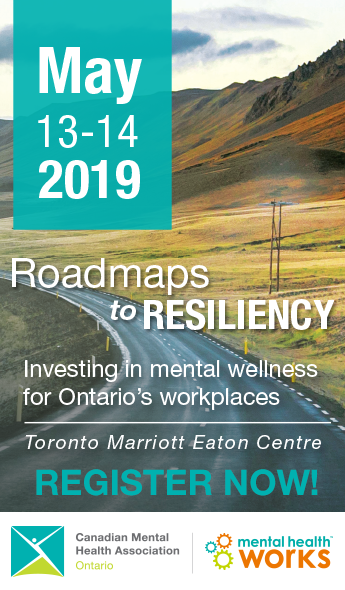 Mental health services, such as the Mental Health Works program from CMHA Ontario, have arisen to help employers, managers, unions and employees learn about human rights requirements and promising practices in promoting mentally healthy workplaces. While the Ontario Human Rights Code broadly addresses disability rights, the specific barriers faced by people with disabilities among equity-seeking groups has led to the Accessibility for Ontarians with Disabilities Act, which sets accessibility standards for businesses and organizations in specific areas, including employment. The relationship between the economy and mental illness is complex and multifaceted. People with mental illness, like the rest of the community, are affected by the larger economic context and job market. Evidence accumulated over decades in both North America and Europe suggests that economic downturns which result in higher rates of unemployment are associated with increased needs for mental health care. Higher rates of psychological distress have been found in low-income households. People with serious mental illnesses are often employed in marginal sectors of the economy and are at increased risk of being laid off when the labour market weakens. Consequently, unemployment is associated with an increase in admissions for psychiatric care. In addition, the link between poor mental health and precarious employment (low-wage, part-time or casual with no benefits) is becoming increasingly evident. People with mental illness who are members of racialized or minority ethnic populations face increased challenges. For example, while many recent immigrants to Ontario have higher degrees of education and training than their Canadian-born peers, they experience high rates of unemployment. Employment rates are generally lower for racialized communities than for people of European descent and some evidence indicates this inequality is likely greater among people with mental illness, with the resulting impact upon both mental health and the experience of mental illness25. Simply having a job is not enough. The quality of work is also important. Research shows that individuals with mental illness are often relegated to minimum-wage jobs26. These types of jobs are often non-standard types of work, such as part-time, temporary work or contracts. In addition, they often lack benefits and room for advancement, and are particularly vulnerable to fluctuations in the economy. The stress associated with precarious employment has been linked to diminished mental health status. One response to low-wage work is providing increased access to education and training opportunities. Labour market success for individuals with mental illness is linked to higher levels of education, especially post-secondary education. Barriers also exist for individuals with mental illness wanting to return to school and complete secondary education programs. These barriers occur due to stigma, discrimination from instructors, onset of psychiatric illness and past educational failures. These barriers are compounded by challenges many potential students face, such as the inability to access financial aid. While the global economy and labour markets may seem to be forces beyond our reach to change, research shows that local actions can make a difference. Access to mental health services that use evidence-based supported employment models can significantly increase the chances of a person with mental illness finding and keeping work. These supported employment services show promise in mitigating the negative impact of the local unemployment rate to some degree. In the largest study to date, people who received support fared better in a tight local labour market than those without this support living in an area with more job openings. Mental health and social services also have a role to play as employers, and as consumers of a range of goods and services. Mental health policy in the United Kingdom includes a role for public services as “exemplar employers” as a key element in their national guidance on vocational services for people with severe mental health problems. CAMH and CMHA branches are proactively using their purchasing and hiring power, with a dedicated focus on hiring people with lived experience and supporting the use of consumer-run businesses. The opportunity exists to build on these strategies through provincial leadership and by supporting research and evaluation of innovative and evidence-based practices. The challenge of supporting people in getting and keeping jobs has led to the development of a range of employment and education support models. Research has clearly shown some of the program characteristics that can lead to success. We now have a body of knowledge that can be applied to employment programs to ensure high levels of placement. Ongoing research is continually improving this knowledge. Atop this foundation of basic knowledge there are ongoing debates and identified areas where more investigation is needed. For example, the research to date on evidence-based practices has been critiqued for a lack of attention to the experiences and needs of racialized populations and gay/lesbian and transgendered communities. There is also the unresolved issue of what types of knowledge should count as “evidence.” Among the different supported employment models, the Individual Placement and Support (IPS) model (discussed in detail below) stands out as having superior employment and consumer satisfaction outcomes. Yet, many providers feel that the research base is not yet sufficiently diverse and think that other models may emerge from future work. All practitioners agree that a “value-based supported employment program [that] offers choice and encourages self determination for all individuals by incorporating a full range of employment options that will increase the opportunity for goal planning and success” is critical [emphasis in the original]. The adoption of new research findings is also critical. Research has shown that, even when good programs offer good services, they may be slow to adopt emerging and evidence-based practices related to employment and often focus on more immediate clinical goals at the expense of recovery and rehabilitation related outcomes. Even with recent new investments in these best-practice programs in Ontario, consumers continue to report a lack of access to employment and other supports. As a result, people connected with these services continue to have high rates of unemployment. A final issue is funding. With a shortage of dedicated funding dollars to support longer-term approaches to employment, mental health service providers have turned to other funding sources, such as the Ontario Disability Support Program employment supports program (Ministry of Community and Social Services), Employment Ontario (Ministry of Training, Colleges and Universities) and federal resources such as Human Resources and Skill Development Canada’s Opportunities Fund. However, these programs are not designed to accommodate the non-linear path to employment often taken by persons with serious mental illness. Despite the shortfalls, there are currently some positive changes taking place, including a reform of the Employment Ontario service. While job seekers with mental health problems are not defined specifically, the government has committed to a transformation process that recognizes the uniqueness of their “customers” and the need to break down silos and integrate supports. The Individual Placement and Support (IPS) model is built around several key principles that have been shown to have the greatest impact on supporting people to find and keep work. The first and foremost principle is that people can access IPS based on their interest in finding work, rather than on decisions made by others, such as counselors, psychiatrists or family members. The goal of IPS services is to support people to move into competitive employment (as opposed to sheltered workshops or volunteering) as soon as possible and to assist people to find jobs they are interested in. Programs have been shown to be most effective when vocational and mental health services integrate their work, including the provision of ongoing support. Helping people navigate the maze of income benefits and work is also a key role of IPS. With a well-established evidence base, researchers and mental health services are now looking to better understand the essential components of IPS so that adaptations can be best made to respond to the needs of specific job-seekers and local settings. This could include a focus on consumers who face multiple barriers in the workforce, such as older adults, parents with dependent children and racialized populations. Workers with more advanced skills who are re-entering the workforce after a lengthy absence face their own unique challenges that may require program modifications. There is also evidence that the IPS model could be beneficial to persons with concurrent disorders. As well as IPS, other models that have shown promising outcomes include the Choose-Get-Keep model and the Diversified Placement Approach. Choose-Get-Keep has many of the same features as IPS, notably its blending of employment and mental health supports. It is an approach that can be applied to a range of different program models, not just employment, and has shown some promising results. With an emphasis on longer-term employment support, it is a way of working with people with mental illness and supporting them in their own process of rehabilitation and recovery as they “choose, get, and keep” employment or other valued goals. Choose-Get-Keep has been incorporated into some Ontario employment programs (see, for example, CMHA Sudbury-Manitoulin Branch). The Diversified Placement approach grew out the clubhouse vocational model. It incorporates a stronger focus on pre-vocational work, based on a gradual approach to support people moving along the continuum towards paid (if not competitive) work. Research in the U.S. on this approach has taken place in rehabilitation agencies that have often developed their own agency businesses to provide employment for people who would face almost insurmountable odds to working in the competitive job market. Adding interventions to different supported employment models like motivational interviewing and cognitive remediation have also shown promise. Cognitive remediation is a method to train people in learning skills that addresses the cognitive problems they experience as a result of severe mental illness. Motivational interviewing is a therapeutic treatment that supports people to move towards positive changes in their lives and has been found through extensive research to be an effective treatment. Ongoing research and practice in the field is required to evaluate the potential of these approaches. A growing area of promising practices is the development of social enterprises, businesses that have a “double bottom line combining financial returns with a social mission.” The Ontario government has made the research and expansion of this model one of the elements of its poverty reduction strategy. Ontario consumer/survivors have played a leading role in the development of social businesses for their community. Other promising aspects of this approach include social hiring programs that proactively recruit and support the employment of members of marginalized communities through partnerships between employers and community-based employment services. Many people with mental health problems and psychiatric disabilities are interested in and have been successful in becoming self-employed or running small businesses. However, complicated benefit rules and a lack of service provider expertise can act as barriers to starting or expanding these opportunities. The Social Venture Development Initiative — a partnership between the Rotman School of Management at the University of Toronto and CAMH, recently initiated and supported by Joseph and Sandra Rotman — promises to develop knowledge in this area. In addition to providing support to consumers to run their own business, the project will help identify capital needs and offer micro-loans. These businesses combine real work in the market, community development and employment for consumer/survivors. Alternative businesses have been developed in Ontario as part of the solution to high unemployment and marginalization; they are almost exclusively created, led, managed and run by consumer/survivors. Affirmative businesses offer similar benefits while being connected with mental health agencies or other service providers. Among other positive outcomes, these models help develop a strong sense of community and rebuild people’s sense of hope and self-esteem. While many of these businesses are very successful in traditional economic terms, government funding is needed to support their management infrastructure. Even when new markets are available, these businesses often can’t expand without additional funding support. Enhanced support would allow these businesses to continue to expand, develop and refine their models. Supported education is a promising practice that helps people with mental health problems to achieve their education goals by developing their skills through specialized support within the classroom. Students attend programs on mainstream campuses, supported by a combination of mental health services and academic accommodations. Accommodations range from educational counselling and academic skill building to test methods that can accommodate people’s learning styles and disabilities. Students receive college credits for the program, which serves not only to advance their education, but also to improve their self-esteem and quality of life, often leading to the next step of employment. Augmented education is a novel strategy that combines elements of both supported employment and supported education. The model has been developed by CAMH and George Brown College in Toronto and has shown promising results. Two examples of this model — an assistant cook program and construction craft worker — have been piloted. In addition to offering in-classroom accommodations, students can also access job placement and employment supports after they graduate. These models have been developed through innovative partnerships between mental health, college and different government ministries. Ongoing support and focus on building and sustaining these partnerships are needed to expand access to these models for all who could benefit from them. Effective and coordinated income programs are needed to support the aspirations of consumers for further education and return to work. A consistent and comprehensive set of incentives is needed to support people who want to enter the workforce, increase their skills or pursue education. Significant reforms have occurred recently, making Ontario a leader within Canada in promoting inclusion for people with disabilities. However, this is a limited achievement as Canada overall remains one of the least progressive systems, compared to other jurisdictions, according to the Organization for Economic Co-operation and Development (OECD). Social policies need to balance what the OECD calls “twin but contradictory goals” of supporting full inclusion of people with mental illness and other disabilities in education and employment, and also ensuring a minimum income for those periods of time — short, episodic, or permanent — when people are unable to work. While the balance remains challenging, comparable jurisdictions around the world have achieved high levels of integration and compensation, according to a typology of systems developed by the OECD. Among 20 countries, including the United States, Australia, Spain, and Sweden, Canada had the second weakest disability policy system, ahead only of Korea. Other countries have instituted reforms to their disability system, many of which are based on a philosophy of encouraging participation through linking receipt of income to attempts to return to work, or increasing participation in employment. These reforms have often been implemented in conjunction with the development of new policy frameworks and enhanced access to employment support services. Changes occurring in many countries reflect a major shift in basic thinking about disability pensions. In the past, receiving benefits was based on an implicit understanding between recipient and provider. The recipient had to prove their incapacity and this incapacity was fundamental to receiving benefits. Signs of capacity, such as doing volunteer or part-time work, could be risky — they showed capacity and therefore threatened the pension benefits. An unintended consequence of this has been that recipients had to demonstrate helplessness and, at least in the area of work, remain excluded from productive activity in order to remain eligible for disability income. The new paradigm is very different. It sees individuals with disabilities as having capacities and recognizes that society needs to support the expression of these capacities in productive work. Instead of being a threat to a person’s status as disabled, work becomes an expectation and something to be encouraged. To make this realistic, the impact of the disability on work is assessed and accommodations made to allow an effective contribution. To help people return to work, income support programs should have two characteristics. They must be prepared to make employment feasible (by providing employment supports) and attractive (by including incentives and continued income supports). However, the current ODSP system poses three types of disincentives that make it difficult for this situation to occur: regulations, administration and communication. ODSP regulations create disincentives for some clients who want to return to work. People receiving ODSP must make a challenging cost-benefit analysis in attempting to balance income security with employment or educational opportunities. While revised regulations mean that the majority of recipients will end up with more money under the new system, the reporting requirements for both ODSP recipients and employment support providers are onerous, discouraging involvement. For those who work significant hours there is also a high marginal tax rate, which amounts to about 50 percent of every dollar earned. The challenge of developing regulations that balance income support and employment earnings is one faced in other provinces and countries. Economic modeling and other research have indicated that one of the best ways to promote a return to work is increasing the amount an individual may earn before income supports are reduced. The administration and layering of programs creates difficulties. Many consumers are on both Canada Pension Plan – Disability (CPP-D) and ODSP, but these two programs lack coordination and alignment. For example, there are differences in program philosophies, intake processes, benefit levels, and return to work processes. This creates confusion and barriers for many consumers. In addition, consumers report that the regulations are unevenly administered by individual staff and offices. There is a significant communication gap as many consumers and staff in the mental health system struggle to understand the complex array of policies and services that are available, and policies are often arbitrarily interpreted. Like the recovery process itself, progress from disability to work is rarely accomplished in a linear fashion. Many individuals fear losing benefits and also fear returning to work because of the possibility of encountering a period without any income or safety net if they become ill or lose a job. Pension or benefit programs must be flexible, creative, and have good return-to-work provisions. Both ODSP and CPP offer rapid reinstatement of benefits, essential for many people with mental illness and other disorders with episodic acute disability. If these opportunities are to be realized, income support programs must encourage and support people with mental illness to take every opportunity they can to work or go to school, and must recognize that there may be interruptions in the process. In practice, however, recipients and advocates find that the ODSP system does not deal well with sporadic and fluctuating earnings. It is not enough to have policies in place; recipients need to be informed of the policies and must feel confident that policies as written will be followed through. There are a variety of additional innovative labour market interventions that have been developed and need to be explored for their potential to expand employment opportunities for people with mental illness. Two options are: employer incentives for hiring, and penalties for not hiring, a diverse workforce; and targeted wage subsidies. Employer incentives have been developed with other economically marginalized communities, such as new immigrants and single mothers. A revised funding model including milestone payments, an expanded menu of compensatory interventions and different rates of compensation could improve access to services, leading to increased sustainability, as well as increased job placement and retention rates for persons with more significant barriers to employment. Employers and educational institutions are increasingly being recognized as key allies in promoting the inclusion of people with mental illness. Recognizing that increased diversity is a business necessity and a demonstration of good citizenship, there are many opportunities to build new and ongoing relationships with these key stakeholders. Equal opportunity, quality jobs and lifelong learning, access to evidence-based services, and flexible disability benefits— these are the four factors that can produce success in education and employment in Ontario for people with serious mental illness. The way forward is known and some progress is being made. But something is clearly missing. Addressing the unacceptable rates of unemployment for people with significant mental illness is a challenge that demands collaboration between all levels of government, policy makers, service providers and consumers. Amid competing demands in a complex health care system, employment supports have not been a priority. Lack of attention to this important determinant of health has translated into a fragmented system. The Ontario government has acknowledged that many people with a serious mental illness require employment-related supports and services that are more intensive and long-term than those provided by more generic government programs. This recognition was the impetus for Making It Work, the first provincial policy framework for employment supports, produced in 2000. The goal of this document was to set three-year policy directions that would improve employment services and supports to persons with serious mental illness. The government envisioned a shared-service model approach — in partnership with the Ministry of Community and Social Services, federal government programs, the business community and the training and education sectors — that would result in a comprehensive range of employment support options to address the unique needs of persons with serious mental illness. Making It Work was never implemented, in spite of reports that followed calling for the adoption of its principles and key program elements. The absence of policy implementation has resulted in a patchwork of funding mechanisms that do not align with the specialized supports that were envisioned then and are still needed today. The 2009 release of a four-year evaluation of recent community mental health investments in Ontario illustrates the consequence of not having a formal policy framework to guide program delivery. The Systems Enhancement Evaluation Initiative (SEEI) found that mental health clients are still confronted by extreme poverty, lack of education and unemployment. System leadership and community champions, critical elements to influence change, are required. Galvanizing stakeholders around a coordinated approach is challenging, due to the involvement of multiple ministries, each with its own unique mandate, and funding arrangements. The Ministry of Health and Long-Term Care, Ministry of Community and Social Services and, more recently, the Ministry of Training, Colleges and Universities are the three key ministries that provide funding for persons with mental health disabilities. There is increasing emphasis on inter-ministerial dialogue to address the intersection of programs affecting people with mental illness, a shift that may produce positive results. If inter-ministerial collaboration is feasible, the question becomes: who will provide leadership in setting employment supports policy and incorporating the values and perspectives of people with lived experiences? The development of a new mental health and addictions strategy for Ontario holds promise for a better future. Education, employment and, by corollary, adequate income have all been recognized as key determinants of health for people with a mental illness. Transforming the system and creating healthy communities can best be achieved with a multi-faceted strategy for implementation that includes addressing the four major factors that challenge people with mental illness in achieving their educational and employment goals. These same factors also need to be addressed by other government decision-makers and key stakeholders, including the broader education and employment support sector. And how will local initiative and innovation be recognized and championed? SEEI and the Ontario Mental Health and Addictions Knowledge Exchange Network (OMHAKEN) may both be valuable vehicles for encouraging and supporting innovation and creativity by consumers and service providers. These initiatives will be useful for sharing promising practices to support the development of evidence-based action. Building an evidence-based system will require support for adherence to the key elements of the models and ongoing development of workforce capabilities and skills. Including cultural competence and respecting experiential knowledge and skills that consumers bring to the table are also key to an evolving process that is both inclusive and comprehensive. In order to better understand the interrelationship between funding mechanisms, supportive programming and employment for individuals with mental illness in the Ontario context, funding for such research is necessary. Program development is often based on research from other jurisdictions, particularly the United States. Research is required to understand the extent to which it is transferable, relevant and accurate for decision making in Ontario. Taking action is the next step. The evidence tells us that we can address the barriers to greater workforce participation for persons with mental illness, while continuing to learn from program and policy innovations. The foundation of inclusive workplaces is the absence of discrimination against people with mental health problems. This must include strong support for legal advocacy for those who have experienced discrimination in the workplace, and better support for education about workplace rights. Mental health, social service and other public sector systems must become “exemplary employers.” This will demonstrate that healthy, thriving organizations hire and support employees with mental health problems and purchase services produced by alternative and affirmative businesses. The Government of Ontario should provide sustained funding to innovative supported education models that show promise in facilitating improved workforce participation, such as George Brown College’s augmented education program. Promising practices are developing at the community level as service providers deliver innovative, client-centred approaches. We must identify and evaluate new and adapted employment support models that can be effective in supporting long-term job retention. Information and access to evidence-based employment support models can be facilitated and shared through knowledge exchange networks operating in Ontario. The policies and procedures of income assistance programs — particularly the rules governing how much recipients may earn without penalty — have a significant impact on labour market participation. Sometimes programs work together to reinforce dependence, rather than promoting work and recovery. As a start, the Government of Ontario should assess the efficacy of changes made to ODSP, particularly the amendments to earning exception rules. The government implemented significant changes to the rules governing how ODSP payments are affected by earned income. These amendments should be evaluated to determine whether they have facilitated workforce participation. To realize the opportunities that this paper has identified will require concerted action between key decision-makers. Provincially, the Ministries of Health and Long-Term Care, Community and Social Services, and Training, Colleges and Universities are key to action, and regionally, the Local Health Integration Networks are critical. We recommend a summit of these groups and other stakeholders convened by CMHA Ontario and CAMH to map a way forward that includes measurable education and employment goals. The rate of workforce participation for people with mental health problems is unacceptable. The lack of concentrated efforts in this area increases health care costs and compounds the social consequences of mental illness. We can do much better. CAMH and CMHA Ontario recognize that no single policy, regulatory or funding initiative can radically improve the rate of workforce participation for people with mental health problems. Instead, making progress requires a sustained commitment to the rights of people with mental illness, a commitment to explore innovative approaches to service delivery and a thoughtful review of disability income supports to ensure they do a better job of promoting social inclusion. Canadian Mental Health Association Ontario and Centre for Addiction and Mental Health. Employment and Education for People with Mental Illness. Discussion Paper. Toronto: January 2010. G.P. Harnois & P. Gabriel, Mental Health and Work: Impact, Issues and Good Practices (Geneva: World Health Organization and International Labour Organization, 2000); Canada, Standing Senate Committee on Social Affairs, Science and Technology, Out of the Shadows at Last: Transforming Mental Health, Mental Illness and Addiction Services in Canada, 2006, retrieved December 3, 2007, from http://www.parl.gc.ca/39/1/parlbus/commbus/senate/com-e/soci-e/rep-e/rep02may06-e.htm; WHO Commission on Social Determinants of Health, Closing the Gap in a Generation: Health Equity through Action on the Social Determinants of Health — Final Report: Executive Summary, 2008, retrieved April 9, 2009 from http://whqlibdoc.who.int/hq/2008/WHO_IER_CSDH_08.1_eng.pdf. M. Corbière & T. Lecomte, “Vocational Services Offered to People with Severe Mental Illness,” Journal of Mental Health (2009; 18: 38-50). G.R. Bond et al., “Implementing Supported Employment as an Evidence-Based Practice, Psychiatric Services (2001; 52: 313-322); G. Waghorn & C. Lloyd, “The Employment of People with Mental Illness,” Australian e-Journal for the Advancement of Mental Health (2005; 4, Supplement), www.auseinet.com/journal/vol4iss2suppl/waghornlloyd.pdf. W.A. Anthony et al., “Relationship between Psychiatric Symptomology, Work Skills, and Future Vocational Performance, Hospital and Community Psychiatry (1995; 46: 353-358); Bond et al., op. cit. J.S. Brekke et al., “Psychosocial Functioning and Subjective Experience in Schizophrenia,” Schizophrenia Bulletin (1993; 19: 599-608). B. Angell & M.A. Test, “The Relationship of Clinical Factors and Environmental Opportunities to Social Functioning in Young Adults with Schizophrenia, Schizophrenia Bulletin (2002; 28: 259-271). Harnois & Gabriel, op. cit. ; Canada, Out of the Shadows at Last, op. cit. ; WHO Commission on Social Determinants of Health, op. cit. ; Brekke, op. cit. Harnois & Gabriel, op. cit. ; S.B. Harvey et al., “Mental Health and Employment: Much Work Still to Be Done, British Journal of Psychiatry (2009; 194: 201–203); E. Latimer, et al. (2005). Generalizability of the IPS Model of Supported Employment for People with Severe Mental Illness: Results and Economic Implications of a Randomized Trial in Montreal, Canada,” Journal of Mental Health Policy and Economics (2005; 8[Supplement 1]: S29); Waghorn & Lloyd, op. cit. Centre for Addiction and Mental Health, Canadian Mental Health Association, Ontario, Ontario Mental Health Foundation, & Government of Ontario, Making a Difference: Ontario’s Community Mental Health Evaluation Initiative, 2004: 15. Canadian Mental Health Association, Ontario, “Backgrounder: Poverty and Mental Illness,” November 2007, http://ontario.cmha.ca/public_policy/poverty-and-mental-illness/; Harvey et al., op. cit. R.C. Kessler, et al., “Social Consequences of Psychiatric Disorders, I: Educational Attainment,” American Journal of Psychiatry (1995; 152: 1026-1032). Centre for Addiction and Mental Health, et al., Making a Difference, op. cit. ; J. Leff & R. Warner, The Social Inclusion of People with Mental Illness (New York: Cambridge Press, 2006). Leff & Warner, op. cit. Ontario Human Rights Commission, “Guidelines on Developing Human Rights Policies and Procedures,” January 2008, retrieved June 24, 2009 fromhttp://www.ohrc.on.ca/en/resources/Policies/gdpp?page=gdpp-I_.html#Heading428. OPSEU, Equity Unit, “Human Rights and Equality Law,” n.d., retrieved June 24, 2009 from http://www.opseu.org/committees/equity/equalitylaw.htm. Ontario Human Rights Commission, “Duty to Accommodate Mental Health Disability Upheld by Landmark Ontario Human Rights Decision,” December 18, 2007, retrieved June 4, 2009 fromhttp://www.ohrc.on.ca/en/resources/news/lane. Ontario Human Rights Commission, “Policy and Guidelines on Disability and the Duty to Accommodate,” November 23, 2000, retrieved June 4, 2009 from http://www.ohrc.on.ca/en/resources/Policies/PolicyDisAccom2?page=PolicyDisAccom2-Contents.html. Ontario Human Rights Commission, “Our Changing Mission,” 2009, retrieved June 4, 2009 from http://www.ohrc.on.ca/en/commission/mission. Ontario, Ministry of Community and Social Services, “Development of the Employment Accessibility Standard: Where We Are Now,” 2009, retrieved June 4, 2009 from http://www.mcss.gov.on.ca/mcss/english/pillars/accessibilityOntario/accesson/business/employment/. J.A. Cook et al., “Effects of Local Unemployment Rate on Vocational Outcomes in a Randomized Trial of Supported Employment for Individuals with Psychiatric Disabilities,” Journal of Vocational Rehabilitation (2006; 25: 71-84); R. Kilian & T. Becker, “Macro-Economic Indicators and Labour Force Participation of People with Schizophrenia,” Journal of Mental Health (2007; 16: 211-222); Martin Prosperity Institute, “Ontario in the Creative Age,” February 5, 2009, http://martinprosperity.org/research-and-publications/publication/ontario-in-the-creative-age-project; Organization for Economic Cooperation and Development, Transforming Disability into Ability: Policies to Promote Work and Income Security for Disabled People (Paris: OECD Publishing, 2003). H. Orpana, L. Lemyre & R. Gravel, “Income and Psychological Distress: The Role of the Social Environment,” Health Reports (March 2009; 20), Statistics Canada, Catalogue no. 82-003-XPE. Kilian & Becker, op. cit. ; Leff & Warner, op. cit. WHO Commission on Social Determinants of Health, op. cit. Ontario, Breaking the Cycle: Ontario’s Poverty Reduction Strategy, 2008, retrieved April 9, 2009 fromhttp://www.growingstronger.ca/english/poverty_report_access.asp; P. Hall & P. Lahey, “Intersecting Flows: Hi-Tech Clusters, Immigrant Employment and Canadian Cities,” unpublished ; N. Weiner, “Breaking Down Barriers to Labour Market Integration of Newcomers in Toronto,” IRPP Choices (September 2008; 14), retrieved April 28, 2009 from http://www.irpp.org/choices/archive/vol14no10.pdf. Colour of Poverty, “Fact Sheet # 5: Understanding the Racialization of Poverty in Ontario in Employment in 2007,” 2007, retrieved June 4, 2009 from http://cop.openconcept.ca/sites/colourofpoverty.ca/files/FactSheet_5_Employment.pdf; J.K. Burke-Miller et al., “Demographic Characteristics and Employment among People with Severe Mental Illness in a Multisite Study,” Community Mental Health Journal (2006; 42: 143-159). J.A. Cook, “Executive Summary of Findings from the Employment Intervention Demonstration Program” (Chicago: Employment Intervention Demonstration Program of the University of Illinois at Chicago, 2007), retrieved April 9, 2009 from http://www.psych.uic.edu/eidp/EIDPexecsum.pdf; H. Stuart, “Mental Illness and Employment Discrimination,” Current Opinion in Psychiatry (2006; 19: 522-526). St. Christopher House and Toronto City Summit Alliance, “Time for a Fair Deal: Report of the Task Force on Modernizing Income Security for Working-Age Adults,” May 2006, p. 20, retrieved June 4, 2009 from http://www.torontoalliance.ca/MISWAA_Report.pdf. D.T. Liebert, “Access to Higher Education for the Mentally Ill: A Review of Trends, Implications, and Future Possibilities for the Americans with Disabilities Act and the Rehabilitation Act,” International Journal of Psychosocial Rehabilitation (2003; 7: 119-144). C.T. Mowbray et al., “Supported Education for Adults with Psychiatric Disabilities: An Innovation for Social Work and Psychosocial Rehabilitation Practice,” Social Work (2005; 50: 7-20). Cook et al., 2006, op. cit. National Social Inclusion Programme, NIMHE, CSIP, “Vocational Services for People with Severe Mental Health Problems: Commissioning Guidance,” February 2006, retrieved June 4, 2009 from http://www.dh.gov.uk/en/Publicationsandstatistics/Publications/PublicationsPolicyAndGuidance/DH_4131059. National Alliance on Mental Illness, “Evidence-Based Practices and Multicultural Mental Health,” June 2008, retrieved June 4, 2009 from http://www.nami.org/Template.cfm?Section=Fact_Sheets1&Template=/ContentManagement/ContentDisplay.cfm&ContentID=63974; Ontario Federation of Community Mental Health and Addiction Programs, Embracing Cultural Competence in the Mental Health and Addictions System, June 2009, http://www.ofcmhap.on.ca/node/465. R.E. Drake et al., “Social Security and Mental Illness: Reducing Disability with Supported Employment,” Health Affairs (2009; 28: 761-770). J. Dorio, “Tying It All Together – The PASS to Success: A Comprehensive Look at Promoting Job Retention for Workers with Psychiatric Disabilities in a Supported Employment Program,” Psychiatric Rehabilitation Journal (2004; 28: 32-39). Centre for Addiction and Mental Health et al., Making a Difference, op. cit. ; Harvey et al., op cit. ; S. Lurie, B. Kirsh and S. Hodge, “Can ACT Lead to More Work? The Ontario Experience,” Canadian Journal of Community Mental Health (2007; 26: 161-171). J. Nandlal et al., “Matryoshka Project: Program Perspectives from Service Users’ Points of View,” Systems Enhancement Evaluation Initiative, 2007. G.R. Bond, “Supported Employment: Evidence for an Evidence-Based Practice,” Psychiatric Rehabilitation Journal (2004; 27: 345-359). Canadian Mental Health Association, Ontario, “Investigation of Employment Support Needs of CMHA Branches in Ontario,” unpublished . G.R. Bond, R.E. Drake & D.R. Becker, “An Update on Randomized Controlled Trials of Evidence-Based Supported Employment,” Psychiatric Rehabilitation Journal (2008; 31: 280-290); J.A. Cook et al., “Results of a Multisite Randomized Trial of Supported Employment Interventions for Individuals with Severe Mental Illness,” Archives of General Psychiatry (2005; 62: 505-512); M. Corbière et al., “The Fidelity of Supported Employment Implementation in Canada and the United States,” Psychiatric Services (2005; 56: 1444-1447). Bond, 2004, op. cit. ; C. Carroll et al., “A Conceptual Framework for Implementation Fidelity,” Implementation Science (2007; 2: 40); M.P. Salyers et al., “What Makes the Difference? Practitioner Views of Success and Failure in Two Effective Psychiatric Rehabilitation Approaches,” Journal of Vocational Rehabilitation (2008; 28: 105-114). Burke-Miller et al., op. cit. D. Becker et al., “Supported Employment for People with Co-occurring Disorders,” Psychiatric Rehabilitation Journal (Spring 2005; 28: 332-338). E.S. Rogers, W.A. Anthony & M. Farkas, “The Choose-Get-Keep Model of Psychiatric Rehabilitation: A Synopsis of Recent Studies,” Rehabilitation Psychology (2006; 51: 247-256). G.R. Bond et al., “A Randomized Controlled Trial Comparing Two Vocational Models for Persons with Severe Mental Illness,” Journal of Consulting and Clinical Psychology (2007; 75: 968-982); Salyers et al., op. cit. Rogers, Anthony, & Farkas, op. cit. Bond et al., 2007, op. cit. S. McGurk et al., “Cognitive Training for Supported Employment: 2-3 Year Outcomes of a Randomized Controlled Trial,” American Journal of Psychiatry (2007; 164: 437-441); W.R. Miller & S. Rollnick, Motivational Interviewing: Preparing People to Change (NY: Guilford Press, 2002). M. Cleary et al., “Psychosocial Treatments for People with Co-Occurring Severe Mental Illness and Substance Misuse: Systematic Review,” Journal of Advanced Nursing (2009; 65: 238-258). Social Capital Partners, “Workforce Development Value Proposition: An Opportunity to Engage in Fresh Practice,” April 27, 2009, retrieved June 4, 2009 from http://socialcapitalpartners.ca/images/uploads/docs/scp-opportunities-conference-apr09.pdf. Ontario, Breaking the Cycle, op. cit. Social Capital Partners, op. cit. ; JOIN (Job Opportunity Information Network), “Opportunities 2009: Informing, Inspiring, Connecting,” presentation at Opportunities Conference, April 2009. R. Warner & J. Mandiberg, “An Update on Affirmative Businesses or Social Firms for People with Mental Illness,” Psychiatric Services (2006; 57: 1488-1492). J. Brown, Working for a Change: A Handbook for Alternative Business Development — How to Start the Process in Your Community (Toronto: Ontario Council of Alternative Businesses, 2002). T. Krupa et al., “Voices, Opportunities and Choices, Employment Club: Transforming Sheltered Workshops Using an Affirmative Business Approach,” Canadian Journal of Community Mental Health (1999; 18: 87-98). T. Krupa, M. Lagarde K. & Carmichael, “Transforming Sheltered Workshops into Affirmative Businesses: An Outcome Evaluation,” Psychiatric Rehabilitation Journal (2003; 26: 359-367). J. Brown, “Metamorphosis: Transforming Out of This World Café from a Vocational Rehabilitation Program to an Alternative Business” (Toronto: Ontario Council of Alternative Businesses and Centre for Addiction and Mental Health, 2003). Brown, Working for a Change, op. cit. Angell & Test, op. cit. Centre for Addiction and Mental Health, Community Support and Research Unit, “Augmented Education: Effectiveness of a New Employment Training and Support Model for People with Mental Illness,” unpublished . See George Brown College, ACET — Assistant Cook Extended Training Program and Construction Craft Worker Extended Training Program, http://www.georgebrown.ca. J. Stapleton & A. Tweedle, “Navigating the Maze: Improving Coordination and Integration of Disability and Employment Policies and Programs for People Living with HIV/AIDS: A Discussion Paper,” 2008, submitted to the Advisory Committee of the CWGHR “Navigating the Maze” project, Canadian Working Group on HIV and Rehabilitation/Groupe de travail canadien sur le VIH et la réinsertion sociale. Organization for Economic Cooperation and Development, op. cit. Centre for Addiction and Mental Health, Community Support and Research Unit, “International Scan of Job Retention and Return to Work Strategies for Persons with Disabilities,” December 2007; P. Lahey & P. Hall, “The Targeted Wage Subsidy Program: How Program Design Creates Incentives for Creaming,” Just Labour: A Canadian Journal of Work and Society (2009; 13); Organization for Economic Cooperation and Development, op. cit. J. Schneider et al., “SESAMI* Study of Employment Support for People with Severe Mental Health Problems: 12-Month Outcomes,” Health and Social Care in the Community (2009; 17); National Social Inclusion Programme, op. cit. P.W. Bush et al., “The Long-Term Impact of Employment on Mental Health Service Use and Costs for Persons with Severe Mental Illness,” Psychiatric Services (2009; 60: 1024-1031); Leff & Warner, op. cit. ; Stapleton & Tweedle, op. cit. ODSP Action Coalition, “ODSP Employment Supports: Feedback from Key Stakeholders,” 2008. Centre for Addiction and Mental Health, 2007, op. cit. ; Ontario, Breaking the Cycle, op. cit. Leff & Warner, op. cit. ; TD Economics, “Special Report: From Welfare to Work in Ontario — Still a Road Less Travelled,” 2005. S. Averett et al., “Labor Supply, Disability Benefits and Mental Illness,” Eastern Economic Journal (1999; 25: 279-288). R. Warner et al., “The Employment and Income of People with Schizophrenia and Other Psychotic Disorders in a Tight Labour Market,” presented at the WPA International Congress on Treatments in Psychiatry: An Update, November 10-13, 2004, Florence, Italy. St. Christopher House and Toronto City Summit Alliance, op. cit. Stapleton & Tweedle, op. cit. Mowbray et al., op. cit. Stapleton & Tweedle, op. cit. ODSP Action Coalition, op. cit. Social Capital Partners, op. cit. SEEI Coordinating Centre, Moving in the Right Direction: SEEI Final Report, March 31, 2009, Health Systems Research and Consulting Unit, Centre for Addiction and Mental Health. T. Krupa et al., “Improving the Employment Prospects of People with Mental Illness: Five Challenges for a National Mental Health Strategy, Canadian Public Policy, (2005; 31[Supplement]); M. Corbière et al., 2005, op. cit.